A few of us attended some of the Plektrum 2009 events in Tallinn. This year's theme was "virtuality" and the festival has grown into a 10 day event! Here are links to a few really interesting projects that you might want to check out. 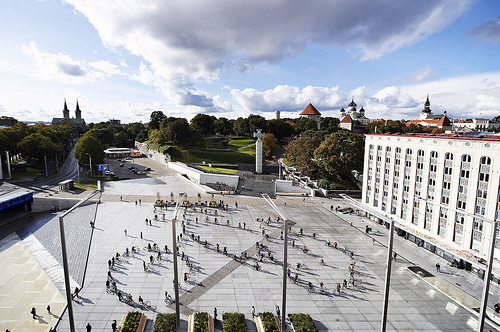 The project combines the technology of m-positioning, media art and sustainable thinking in order to demonstrate where bicyclers actually ride in Tallinn and where bicycle roads are needed. The piece of art that is created from the movement of the participating bicyclers. The project triggered a heated discussion in the media. Attached a photo of the main Ride Your Bike, that says it all. In the morning of May 3rd 2008, more than 50 000 estonians came out of their homes to clean their country. Together in 5 hours they collected more than 10 000 tons of garbage from the roadsides and forests. But that was just the beginning, the idea has been spreading far outside the borders of Estonia. Let’s Do It! World wants to bring all the active people in all the countries together. In order to make this possible, an innovative garbage mapping software has been developed, based on Google Earth program. Right now the initiators of the project are gathering a team of programmers to develop it further to a shared platform tool, for all the participants to use.